Well it's been quite I while since we've last posted something on this blog. But we thought it's time to give it another try. We'll be using this space here to explain to you some of the hidden features on setlist.fm, the ones that we use really often and enjoy a lot but need some background knowledge and/or clicking around to find out. Whenever you're searching for a setlist, you can use common aliases for both artist and venue. 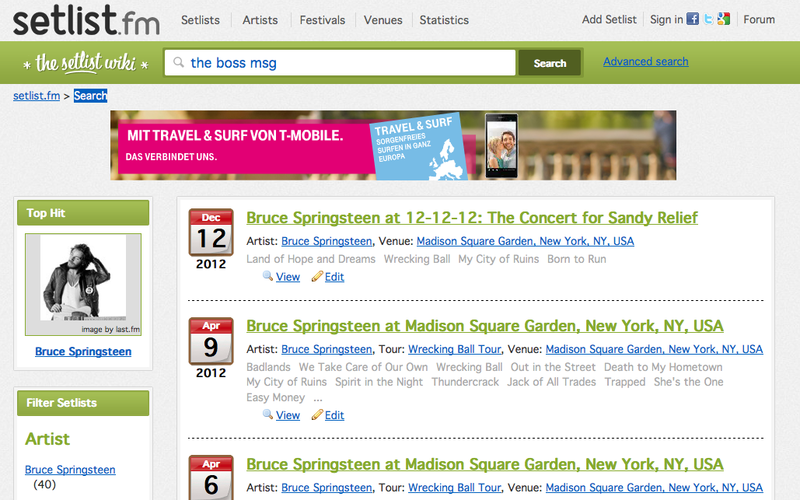 For example if you're searching for "Bruce Springsteen" setlists you could also use his nickname "The Boss". Once you have the search page in front of you, it can be quite overwhelming. Especially when you're searching for a generic name or an artist with a lot of setlists. This is where filtering (or so-called "faceted browsing") comes in handy. There's a box that says "Filter Setlists" on the left hand side of the screen - for smaller screens it's on the top and you have to click on the link that says "Show filter options" first. The box shows search results by artist, country and year. The number in parenthesis is the amount of results found. In the example on the left there are 2232 setlists found for "Bruce Springsteen". You can now click on any artist to show setlists only by this very artist. All other artists get excluded from the search results. The same of course applies for country and year. You can combine the three filters if you want to. E.g. 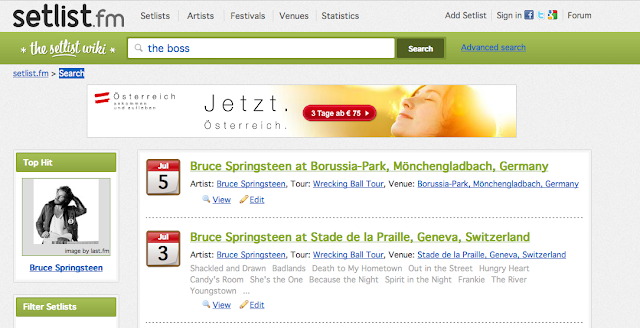 you could click on "Bruce Springsteen", "Spain" and "2012" to get a search result that only displays setlists for Bruce Sprinsteen in Spain in the year 2012 that also match the search query you entered (in our example it's "the boss"). In order to deactivate a filter just click the name again. In our example: if you want to see all setlists by Bruce Springsteen in the year 2012 for all countries, click "Spain" again . You can even tweak this more by narrowing down your search result and e.g. search for "the boss barcelona" and then filter it by Artist, Country and Year. Filtering works for every search result where the filter box is visible. If the box isn't visible then there's nothing to filter and you already see the most narrowed down search result. So now go and search for your favourite artist - we'll be back with another feature explanation soon! Where can we suggest nicknames for bands? The "Nicknames" are the artist aliases from musicbrainz.org. See e.g. Bruce Springsteen. So you could just add it there. But please have a look at their "When to use aliases" first.